This past weekend saw me finish a large number of models. Here are a few that I got some pictures of. This was largely a group of models that I had laying around from other squads and ideas (a couple from previous game editions!). 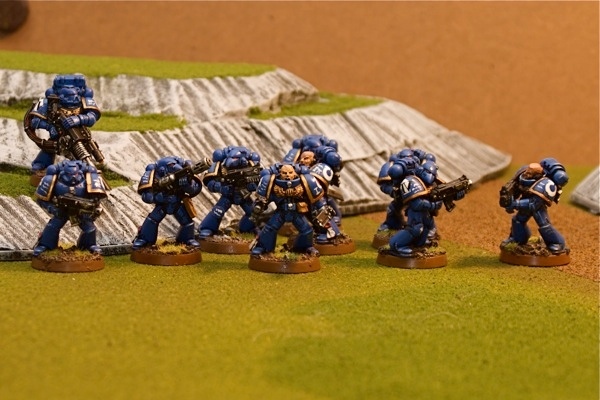 They all got tactical and squad markings- which took awhile to tiddy up. Several of them were demoted from members of the command squad (suddenly only allowed 5 members!). Anyway, I like this squad. When combat squaded I think its tank hunting abilities will be very good. Tactical Squads 5 and 6 are on the priming table. They are from the AoBR sets- ML/Flamer. Kinda boring, but tactically important. Speaking of CS- Tactical IV unloads from its Rhino. 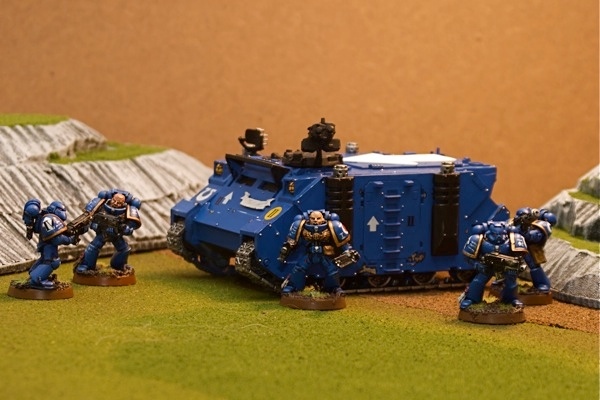 Tactical Squad I- Plasma Death unloads from its Rhino. Ok a couple of things- I used plastic card on top of the rhino's for the 'arrow' designation. I used an entirely too thick card, and can't cut straight lines to save my soul. Emperor bless me, I couldn't even do this when I was 5 in grade school. I don't know what I'll do but something must be done. 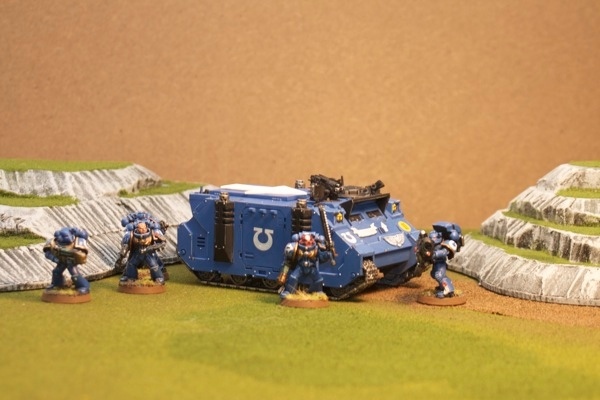 I am thinking about putting the 'razorback' top on and have an extra bolter on each rhino. I intentionally took the pictures from this angle, so as not to make the arrows to obvious. I hate them. I do plan to put some weather effects on all of my vehicles soon. The only problem is that I haven't decided how far to go with the effects. Hmmm.. there is plenty of time for that. Now, some last minute changes to my predators and I'll have them posted as well.